I don’t think I’ve ever really given my burial much thought. I’m quite ambivalent with the whole death thing; I still think it won’t happen. Somehow I will be the one that lives forever. 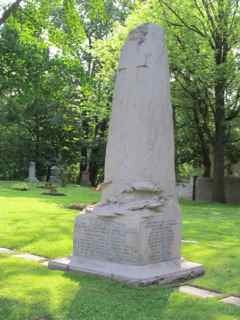 But spending hours on a tour of Toronto’s Mount Pleasant and Necropolis Cemeteries in the centre of Toronto, seeing how some of Canada’s most famous and loved politicians, war vets, athletes, business people, celebrities, are buried– you can’t help but wonder: how will I want the living to visit me? 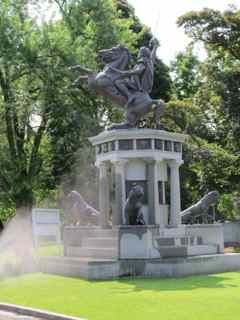 Would I get a granite solider riding a horse like Steve Stavro, of Knob Hill Farms fame and former Maple Leafs owner? Would I be placed in a crypt (my entire casket in a mausoleum) like many Portugeuse and Italians? 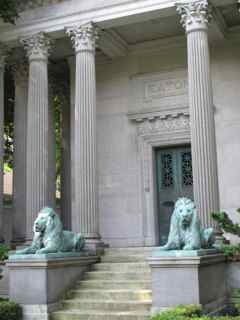 Or, if my family were the Eatons, of the now defunt department store empire, would I want to be nestled inside the family mausoleum guarded by two grand lions and Romanesque columns? Or, maybe place my urn amongst photos of my cycling glory days like the one’s behind glass in the public mausoleum? 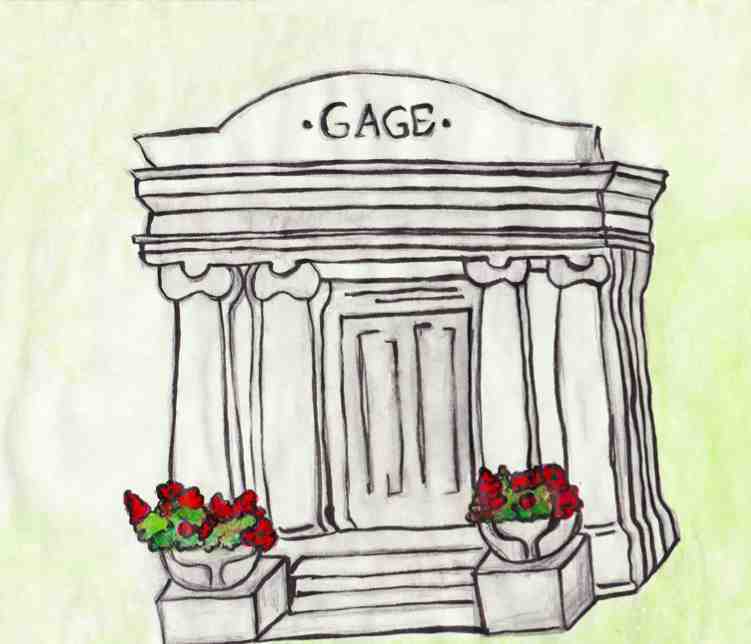 Or, will I do something so extraordinary like Sir William Gage, responsible for the first sanitarium in Canada, and countless hospitals in Ontario, and have a family mausoleum? This is Genevieve’s interpretation of the site: I love that she choose a happy yellow. There’s nothing dark or sad about these sites. Dressed in a white suit and perfect nails, I ask Weir what sculpture she’d get for her site: “A rocking chair.” With five children, and a slew of grandkids, Weir is the consummate mom and natural fit to manage this cemetery. 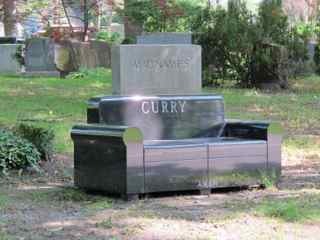 I’m struck my the amount of ways one can be buried, or commemorated. I’ve been to cemeteries around the world: saw Jim Morrison’s grave in Paris’ Lachaise, hundreds of white crosses in Italy’s war cemeteries, Jewish tombs that had been knocked off and buried to hide from the Germans in Krakow Poland and graves glowing in lights and family on Christmas Eve in Norway, when Norwegians celebrate the dead. Or, would I be buried in a mass grave after a tragic accident? Two years before the Titanic, The Empress of Ireland sank killing 1027 people– more than the Titanic. Twenty two are buried under this sleek monument with waves swooshing out of the stone. Created around 1826 when the former cemetery on Yonge and Bloor was becoming too residential, and to accommodate the many new Canadians that were not Catholic and Anglican–the only two denominations at the former site– Mount Pleasant was open to all religions. 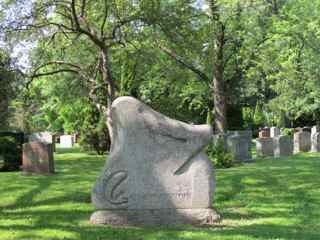 Another cemetery managed by the Mount Pleasant Groups is Necropolis, and another site that accommodated the graves moved from Bloor and Yonge. 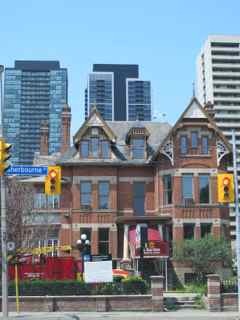 We drive to Cabbagetown, so named for the Irish ancestors who planted cabbage plants in front of their houses, Heather and I get to talking more about Toronto: “It’s a shame about Eatons going under,” I say. “I know, my mom and I would take the subway from home and go to the Eatons and Simpson’s stores. 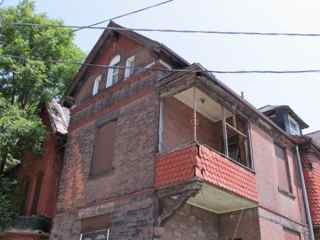 It was an event.” We drive down Howard Street, a short smattering of rooming houses and derelict abandoned homes. “It’s shocking that one block away is Rosedale.” She’s referring to one of Toronto’s most affluent neighbourhoods. Arriving at Necropolis, only a fraction of the size of Mount Pleasant, the feel is bucolic and rustic; the ground is uneven and full of mud patches. 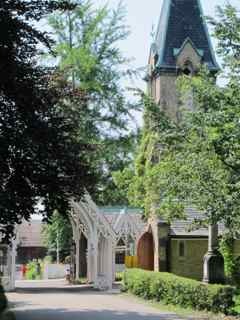 A quaint church and wooden fence at the entrance is fairy tale-like. 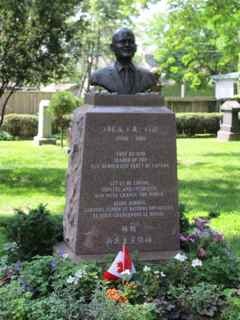 The first site we visit is Jack Layton, the former NDP leader, city councillor, avid cyclist and much loved Torontonian: “his wife, councillor Olivia Chow, who used to be an artist, carved this bust for his grave.” Can you imagine loving someone this much? Walking down a steep embankment, I recognize names on the stones: Hanlan (as in Hanlan’s Point on Toronto islands). Bit by bit, seeing these names, hearing the stories, I feel more connected to Toronto, my new home. I am certainly more forest than mausoleum; more wild than manicured; and more scattered than complete.